Over the month of May we gradually planted all the edibles around the garden. The blueberries moved to their new location in a high spot in the yard that will allow for better drainage so the bushes don’t succumb to the spring floods, and they’ve taken well to their new home. 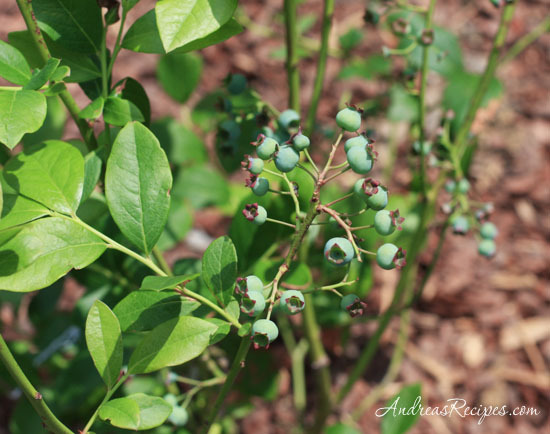 We have early, mid, and late season bushes, so hopefully will have blueberries throughout the summer. 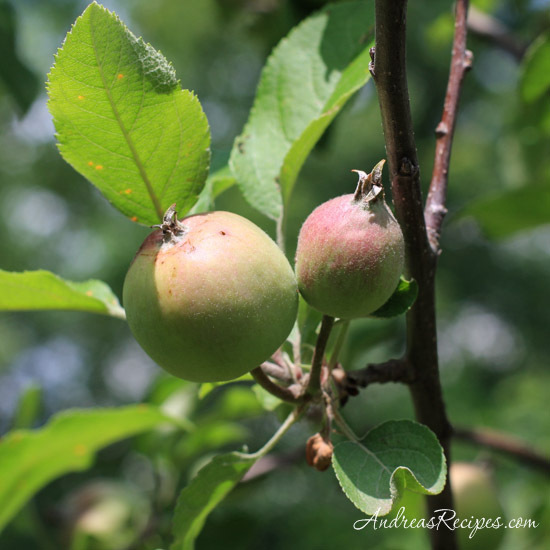 The honeycrisp and gala apple trees have fruit on them, which we will try to protect from the squirrels. The Granny Smith didn’t flower this year, but it’s still a young tree, so maybe in a year or so. 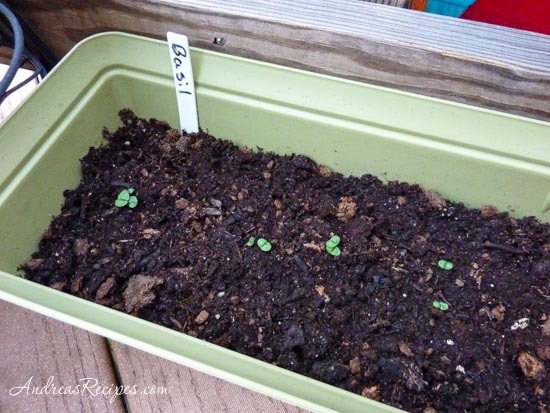 The basil started sprouting this week, bringing thoughts of caprese salad, pesto, and many other delicious things to come. This year we planted Genovese, Thai Siam Queen, Lemon Dani, and Amethyst (a purple Genovese), and hopefully we’ll have a better harvest than last year. Last year we experimented with eggplant in containers, which didn’t work so well, so this year we are trying some small tomatoes and peppers that make small bushes which should be perfect for containers. This week we also saw the first tomato and pepper blossoms. 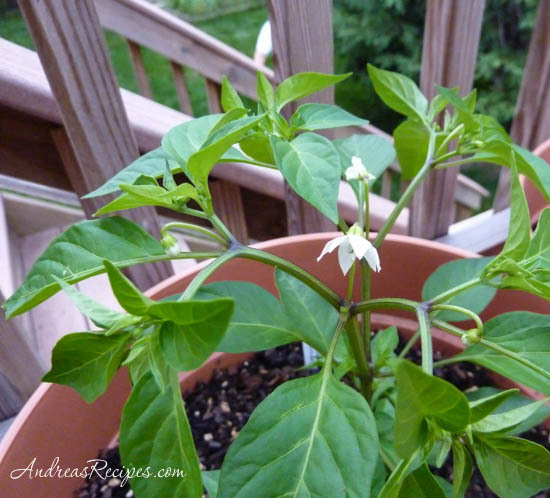 This one is a hot pepper that’s great for containers, the Numex Twilight, which is a piquin-type pepper used for spices. The fruit starts purple and turns yellow, orange, and red. These take 120 days to ripen so it will be a while before they are ready. 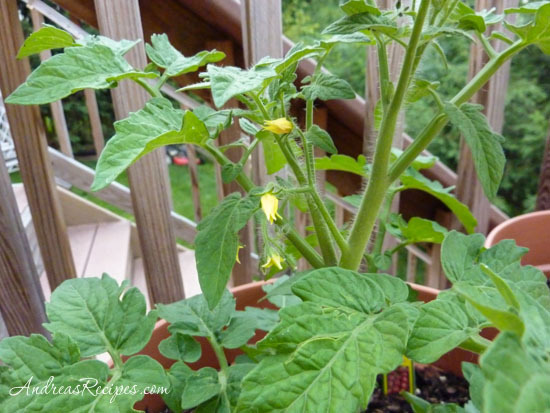 We planted two husky cherry tomatoes in containers, which we hope will give us some early salad tomatoes. Both have blossoms now. 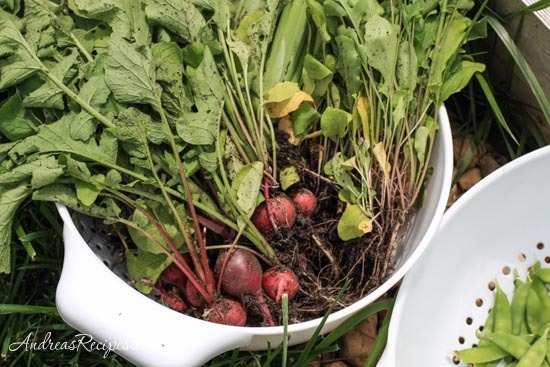 We began harvesting radishes and snow peas last week and the sugar snap peas started coming in this week. Sugar snap peas are one of my favorite little snacks, and eating them fresh off the bush make them taste even better, I think. Your plants all look very healthy! You’re way ahead of me with the radishes, that’s for sure. Thanks Kalyn! We’ve had good luck with the garden so far, crossing our fingers that it will continue. This is the first year we tried radishes, and we really like having them in the garden. Even the boys like them. I seeded radishes in April and we have the little round red ones as well as the white icicles. I love icicle radishes. My father-in-law had such an amazing garden when he was alive. It wasn’t until I tried growing vegetables myself that I developed a real appreciation for how much work he’d put into his garden – and by then it was too late to tell him. Hi Deb! When I was growing up I didn’t understand it either. My parents didn’t always have room for a garden, but they would take us bean picking or strawberry picking or other such activities, and we didn’t appreciate it, especially the part where it took hours to snap all those beans! Right now the boys are moderately interested and we are putting out a lot of effort to keep them interested.